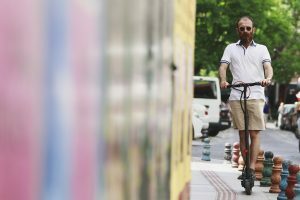 E-scooter sharing programs: are you covered? Move over, ridesharing, there’s a new urban mobility player in town: dockless electric scooter (e-scooter) sharing programs are growing in popularity in cities across the U.S. They operate like bike-sharing programs, but they introduce some interesting insurance issues. The concept is pretty simple: you download an app from companies like Lime and Bird that lets you find and unlock an e-scooter nearby for a small fee, often just $1. You can then, well, scoot off wherever you want to go, paying per mile of riding. These rented devices are “dockless,” so once the trip is completed, you can park your e-scooter anywhere that local ordinances permit – they can’t block public paths, for example. We’re not talking about mopeds or Vespa-like scooters, which allow drivers to sit, can reach relatively high speeds, and often require a driver’s license. These are battery-powered Razor-like scooters, which require a you to stand, often can’t go faster than 15 or 20 mph, and usually don’t require a driver’s license. You can cause a lot of damage at 15 mph, though – trust me, I’ve seen a person step in front of a fast-moving road bike. It wasn’t pretty. So if you cause an accident, are you covered? That’s where things get a bit murky. First off, in most cities, the company renting you the scooter probably won’t cover your liability – that’s part of the multipage user agreement you endorse by clicking the ‘I Agree’ button. You’re basically riding at your own risk. This may change, though, as scooting sharing spreads. San Francisco’s new permitting process, for example, requires these companies to have “adequate insurance” for each of their users. As for your own insurance, whether you’re covered depends on the specific terms and conditions of your policies. You should speak to your insurer or agent. When they were created, the typical homeowners and personal auto policies didn’t really consider whether they’d cover a motorized scooter you just picked up off the curb. Expert opinion and wording are critical. Homeowners: Under a standard homeowners policy (for example, the HO-3), motor vehicles are usually understood to be any self-propelled vehicle and aren’t covered. That is what an auto policy is designed to do. It’s pretty much the same for renters insurance. Personal Auto: The standard personal auto policy excludes liability coverage for a vehicle with fewer than four wheels. The scooters we’re talking about have two wheels. Personal Liability Umbrella: Personal liability umbrella policies (PLUP) offer an extra layer of protection that kicks in when you reach the limit of your underlying homeowners or auto policy. They can also give coverage for things that are excluded from your other insurance policies. For example, unlike an auto policy, a standard PLUP does not usually exclude vehicles with fewer than four wheels. The bottom line is: check with your insurer or agent about your coverages.